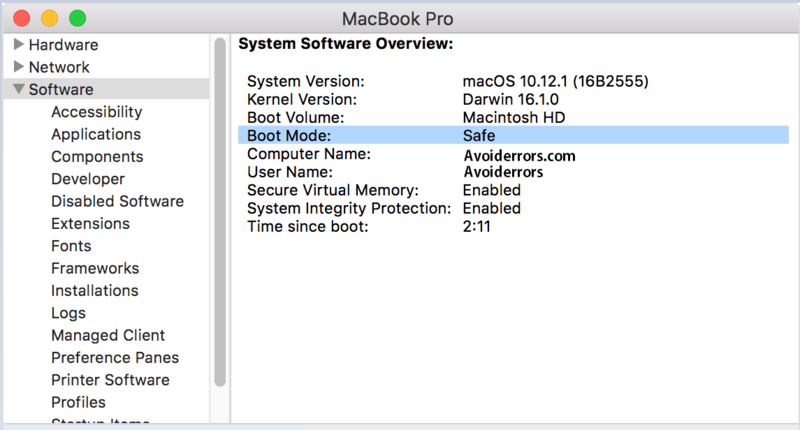 Safe mode can be used as a tool to troubleshoot problems that might prevent the Mac from starting fully or to identify other problems associated with the boot disk. Safe mode (sometimes called “booting in safe mode“) is a way to start the Mac PC, which performs certain checks, and prevents the automatic loading and opening of certain programs. When you start your Mac in safe mode, the following happens. The startup disk is checked and, if necessary, attempts are made to resolve directory errors. Loads only required kernel extensions. Prevent automatic opening of startup and logon objects. Disables fonts installed by the user. Removes font caches, kernel cache, and other system cache files. Starting the computer in safe mode. Start or restart the Mac, then immediately press and hold the Shift key. The Apple logo appears on the display. When the login window appears, release the Shift key. If the boot disk is encrypted using FileVault, you may have to enter credentials twice: to unlock the boot disk and to enter the Finder. To exit the safe mode, restart the computer without pressing any keys during the startup. In addition, if the Mac is launched in safe mode, Safe Boot appears in the upper right corner of the screen. You can’t play movies in DVD Player. capture video in iMovie and some other video apps. Some audio input and output devices may not work. Depending on the Mac model and the OS version of macOS, access to a wireless Wi-Fi network may be limited or unavailable.